The VictorOps Delivery Insights Generic Endpoint accepts messages from any source via an HTTPS POST request in JSON format. As long as you can configure the content of the request, you can post merge, pull request, and build messages into the timeline. If the Delivery Insights endpoint integration has not been enabled, click the blue Enable button to generate your endpoint destination URL. Note: The Delivery Insights endpoint is different than the general API and is the preferred method to create Delivery Insight messages. The payload for Delivery Insights messages is designed to provide concise information regarding your delivery lifecycle with a link quickly bringing you to the information. “event_type” and “entity_type” are the only fields requiring specific values (listed below). The other required fields are used to construct the concise and actionable short message which includes the link. All additional fields are used as part of the long-form expanded message. For example: Opened, Deployed, Created, etc. For example: Success, Failure, etc. 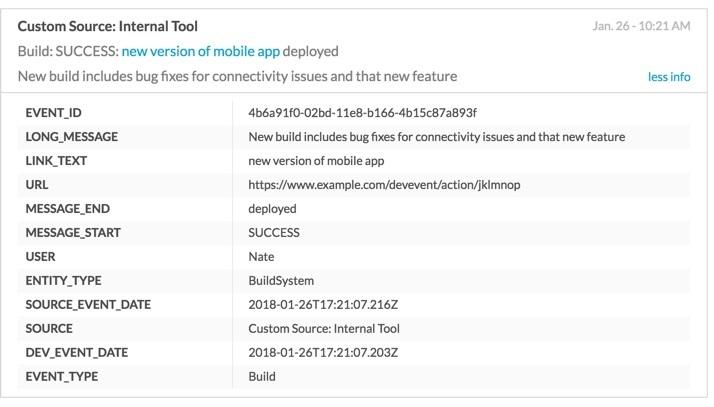 "long_message": "New build includes bug fixes for connectivity issues and that new feature"
You may filter the Delivery Insights messages in the VictorOps timeline based on the “event_type” field values of Branch, Pull Request, Merge, Build, and Deploy. 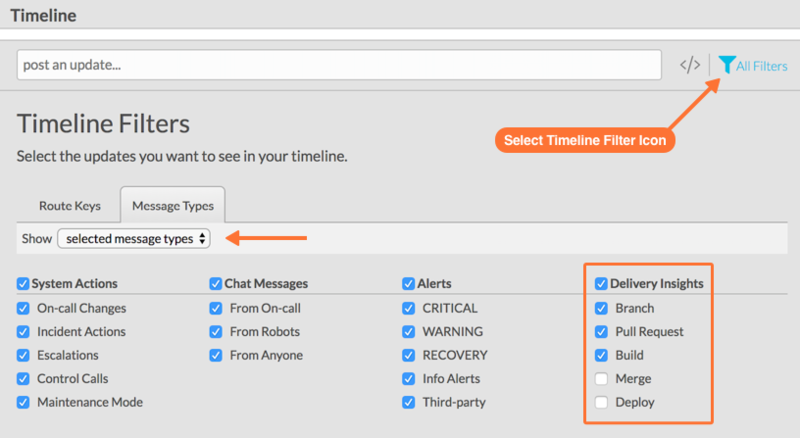 From the main timeline select the filter icon and then Message Types >> selected message types to adjust your timeline filters based on Delivery Insights. The Delivery Insights Quick Filter is located next to the All Filters drop-down, as indicated in the image below. The Quick Filter is an on/off button. Turning it on will filter the Timeline for all Delivery Insights messages that have been pre-selected in the manual filter drop-down. If none of the messages are selected, the Timeline will display all Delivery Insights messages.